On this festive season, all e-commerce giants are going to start the Dussehra Festival Deals by offering the respective discounts. Among all online shopping stores, Flipkart, Amazon and Snapdeal are popular in the list. Soon they are going to start their respective season sales. October is considered as the festive season not only for the people but also for the e-commerce sites. The companies plan in advance to avail the festive season with new offers and discounts to attract buyers. People can have a blast with these offers of the respective dates. India’s largest online shopping giant Flipkart is again back with the biggest sale. The third addition sale of Big Billion Days 2016 is going to start from 2nd October to 6th October. This festive season sale is powered by State Bank of India by instant 10% discount on SBI cards. Flipkart’s Big Billion Days are getting live from 2nd October; witness the jaw-dropping prices online in India. Customers can grab upto 90% off on the products in these Big Billion Days. Flipkart is considering more changes to the third flagship sale by introducing extended loans for customers. Flipkart is the largest online marketplace to place to find separate sales for mobiles, electronics and many more products. It also launched the pre-approved loans for the customers under ‘Buy Now Pay Later Scheme’. 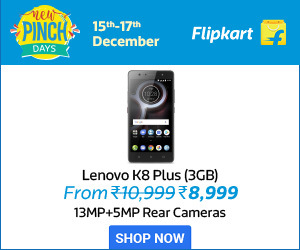 Flipkart introduced ‘Crazy Deal’, under this customers can get upto 99% discount on few selected products. 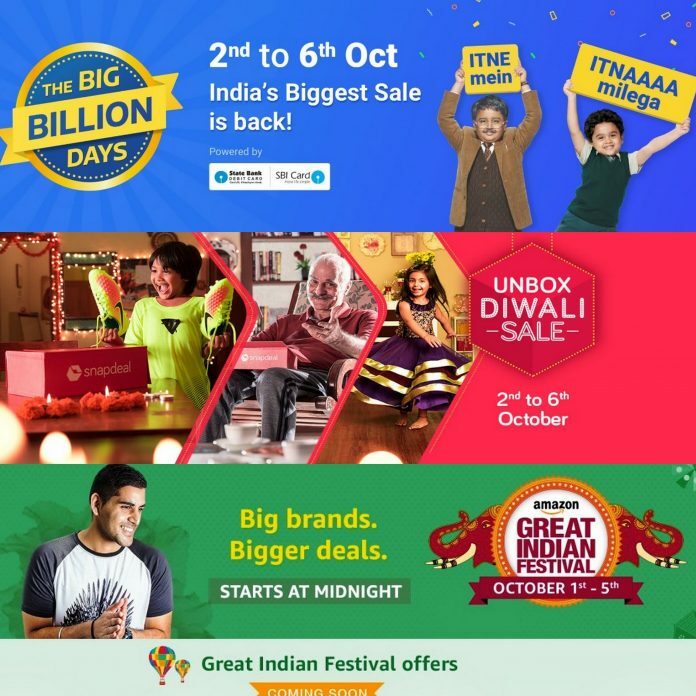 Amazon is again back with its Amazon Great Indian Sale which will be live from 1st October to 5th October. It is going to offer Great Dussehra Festival Deals on Mobiles, Electronics, laptops, home products and much more appliances. During Amazon Great Indian Sale, customers will get 10 percent cash back with HDFC Credit and Debit cards. Amazon will offer fantastic deals and discounts especially for the Indian shoppers on upcoming Dussehra and Diwali. Customers will enjoy the lightening deals for every 30mins on mobiles, laptops, Amazon fashion and all other categories. The Amazon Great Indian Sale starts from midnight 12.00AM of October 1st. Amazon offers 50% off on ethnic wear and kitchen essentials, 40 percent on Trending Jewellery, Electronics and other products and 15% on Jewellery. The Snapdeal Unbox Diwali Sale festive shopping is going to begin from 2nd October to 6th October. Upto 70% off on the products will get in this sale. Also, grab 20 percent instant discount for the CITI bank debit and credit cards. Snapdeal is going to flag its first festive season Unbox Diwali Sale from 2nd October on the same day of Flipkart Big Billion Days. There are different stores in the season sale such as Diwali Combo Offer Store, Navaratri Store, Cleaning Store and Home Decoration Store. The company announced that for every minute new products listed into Unbox Diwali Sale. There will be 60 new mobiles, 20 power banks, 4 tablets, 8 cleaning tools, 1 Air conditioners, 4 Televisions and 20-bed sheets are updated for every minute.